The traffic situation in most urban Indian cities is dismal, with people spending hours battling heavy congestion everywhere they go. This is not just a weekday, working hours’ scenario, but one that extends to weekends too. Therefore Bangalore is no different. Traffic woes in the city make headlines and conversations almost every day. But a lot of commuters in Bengaluru city, are switching to the comfort of using public transportation. This saves them the hassle of driving through jam-packed roads; especially over the weekends. According to a January 2018 report by BMTC, it is estimated that approximately 4.91 million people take BMTC bus services every day, across categories; that’s almost 45% of the city’s commuters. And out of 6500 + buses they own, there are currently over 800 Volvo Buses running throughout Bangalore, catering to the Premium segment of public transport! In an ever-expanding city like Bangalore, maneuvering traffic and getting a parking slot during peak times can be a daunting task, so taking a bus saves you from these hassles. And if you choose a Premium city Bus, like a Volvo, it is a great way to get to your destination over weekdays and explore the city over the weekends. You can enjoy noise-less travel, are not exposed to pollution or harsh weather, and can reach your destination, fresh, in the comfort of an air-conditioned environment. There are loads of taxi operators or autos in the city, but they can be heavy on your pockets. Using buses surely is an inexpensive and comfortable alternative. 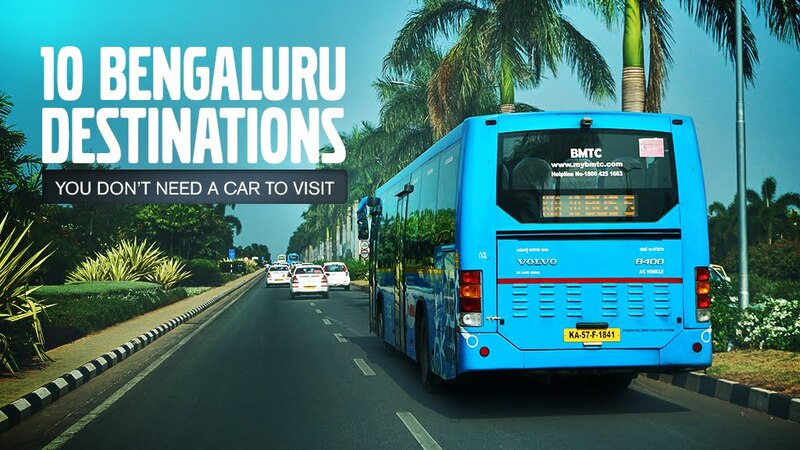 For those of you from the city or visiting the city for a break, we want to highlight some popular destinations in Bengaluru, which you can travel to, in the comfort of Premium Volvo Buses, without taking out your vehicle and. Suggested Read - 5 places you definitely should avoid near Bangalore!! A famous destination for joggers, tourists and fitness enthusiasts, Lal Bagh has a variety of spectacular views to offer for those looking to connecting with nature, taking their kids outdoors and spending some quiet time in one of the few green spaces left in the city. Volvo Bus number: 365, 215H from Kempegowda bus stop to Shanti Nagar; followed by a short walk/auto ride. Located on Kasturba road, there are 3 buildings that house the Visvesvaraya Industrial & Technological Museum, the Government Museum (archeology) and the Venkatappa Art gallery. The complex has everything to offer from science, history, and arts. Therefore a visit to this place will surely enthrall kids and adults with its fascinating collection of artifacts, theatre shows, Science for Children Gallery and virtual music games. Volvo Bus number: 335E from Kempegowda bus stop to Vittal Mallya Road; followed by a short walk/auto ride. Volvo Bengaluru Darshini: Available every morning at 8:30 from Kempegowda bus stop. Only 1 bus a day. If you are a wildlife lover, then you don’t need to head to Bandipur or Muthanga. Instead, make a trip to the Bannerghatta National Park near Bengaluru and experience a thrilling safari. The hour-long tour takes you on a guided tour of the park. Head over there to spot the famous black panther, sloth bear, elephants or the elusive leopard! Volvo Bus number: 365 from Kempegowda bus stop to park entrance; every 10 minutes. Looking for a mall that offers you a plethora of dining options, high-end retail stores or cafes that give you comfortable, cozy corners to spend an evening? Head to the UB City Mall and experience the famous wheat beer, panoramic views of the city and delicious food. Volvo Bus number: 335E from Kempegowda bus stop to Vittal Mallya road. It is a historical, architecturally significant Bengaluru landmark. It lights up every evening and looks majestic in the barrage of colors it is decorated in. A beautiful sight to see and also a good place to take the kids for an evening out! Volvo Bus Number: 335E, 360B, 356, from Kempegowda bus stop to KR circle; followed by a short walk/auto ride. This was India’s first aerospace museum and is a wonderland for aviation & history buffs. The museum has on display various aircraft, parts, machinery and houses a rose garden, herbal garden, Orchidarium, fish pond, and an open-air dining hall! Volvo Bus number: 335E from Kempegowda bus stop to Kadugodi; followed by a short auto ride. The favorite summer destination of Tipu Sultan, the palace is now home to tourists who throng the building to appreciate the classic Indo-Islamic architecture from the 18th century. Beautifully manicured lawns, wooden structures with brown teak wood and golden paint, floral motifs and much more lie in store for the unassuming visitor. Because of this a lot of fashion shoots, especially for ethnic India wear happen at this ancient heritage building. There aren’t a lot of open spaces left in the city today, that can keep kids occupied. But Lumbini Gardens is a great outdoor space for the little ones, families and couple who want to engage in activities like outdoor games, boating and tasting some lip-smacking street food. Therefore, it’s a nice weekend hangout and serves people of all age groups with plenty to offer for everyone. A morning run through a wooded area or an evening walk amidst nature. Away from the city noises, or a quiet spot to do some yoga. Cubbon Park is a great spot for those seeking some peace and quiet, under the green cover of this beautiful park. Volvo Bus number: 335 E, 360 B, 356, 365 from Kempegowda bus stop to KR circle; followed by a short auto ride. BMTC Bangalore Darshini, started in 2008, has 1 Volvo bus running every day from 8:30 am to 6:30 pm, from airport platform at Kempegowda bus stop. It covers ISKCON temple, Chowdiah Memorial Hall, Gavi Gangadhareshwara Temple, Tipu Palace, Bull Temple, Lal Bagh, Freedom Park, Vidhana Soudha, Cubbon Park, Visvesvaraya Museum, and CKP. It finishes the drive at Kempegowda bus stop. The tour costs Rs. 400, accompanied by a multi-lingual guide, who can speak International languages too. If you are looking to head out of Bangalore then we also have a curated list of offbeat destinations in South India!